Queens stand to the left of the King. White moves first and play proceeds clockwise. Checkmate of the King on the immediate left is needed to win. Other Kings may be placed in check only, with the next move going to the player that is in check. Any opposing colour maybe captured on any move. Opposing pieces may be used to create a check or checkmate condition. Example White may employ a Black Knight, Pink Bishop and White Queen to check or checkmate Grey. 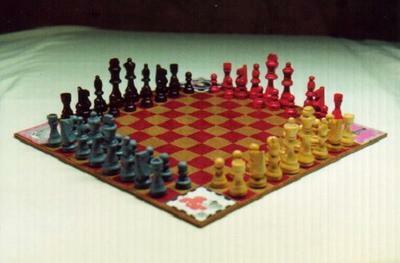 Pawns move ahead traditionally, but may not enter their farthest left or right file. A Pawn may check or checkmate a King occupying these spaces. Pawns must reach their 12th rank to become a Queen. Edge pawns may not capture on their first move. Kings may enter their own coloured corner square and become immune from check or checkmate, provided that both of their Bishops are not captured. When a King enters his corner square, both of his Bishops obtain the power of a Queen instantly. If both Bishops are captured, the King must on his next move return to an unoccupied space around the corner square, but may not move into check. If the King cannot re-enter then he must wait (miss a turn) until a square is available. The short game proceeds until a checkmate or a player resigns. That colour is then removed from the board. The next move is made by the next player to the left, or by the player whose King is in Check as a result of the pieces being removed. When two colours remain, the game is played as Chess and all pieces must as soon as possible enter onto the playing area of Chess. A check or checkmate may not occur intentionally until the move after both sides are on the Chess playing area. Pawn movement direction remains the same if players are opposites. If players are diagonal (i.e. Black and Grey) the opponent to the right (i.e. Grey) must immediately switch pawn movement direction towards the opponent to the left. This player also moves to the vacated seat on his right. A Pawn immediately becomes a Queen if it is on or past the 8th rank of the new playing area. The Grey pieces are removed and the White Queen and one Knight are placed anywhere on these squares on White's first move. Play proceeds using the Short or Long Game Rules. To prevent unauthorized reproduction a minor false rule has been included in this limited edition. Join in and write your own page! It's easy to do. How? Simply click here to return to Favorite Chess Variants.